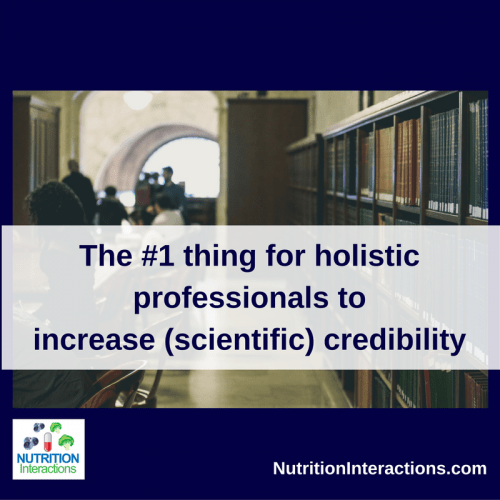 What’s the #1 thing for holistic professionals to increase (scientific) credibility? What’s it going to take to “up” my credibility? Why science? Yes, I know it’s not perfect! So, what’s this #1 thing I need to do? HOW do I find the “balance of the evidence”? Signing off and toasting: To helping increase your credibility – one bit of information at a time! Are you a holistic professional who wants more referrals from doctors and other licensed healthcare professionals? Maybe you want to become a “go-to” resource in your niche? Or maybe you want to be seen as someone who can back up your recommendations with solid science? If you, want to be credible amongst your peers and followers, well, you likely already are. That’s probably why they follow you on social media and ask you for advice. What I’m going to discuss here is being credible amongst licensed healthcare professionals, medical researchers, and other science-based people. If this isn’t what you’re going for, then this article is not for you. If you think that science is too flawed to refer to, this isn’t for you. And if you think that too many people just follow “the establishment”, then don’t waste your time reading the rest. I’m not here to convince you of anything. But, if you want to step up your scientific credibility game, become a “go-to” resource for your niche, and even possibly get client referrals from licensed healthcare professionals, keep on reading. Credibility is not something you can earn overnight. It needs to become a long-term strategy where you consistently provide credible information and recommendations. Objectively credible, I mean. And I’m not going to tell you to go get your MD or PhD degrees, you don’t need that to be credible (but it can help). Plus, there are a number of MDs and PhDs who say lots of un-credible things! Not to mention that there are some solid holistic health practitioners out there. HINT: Scientific credibility is going to take a lot more than referring to your text books, regardless of where you went to school. Well, I could talk about this for days, because it’s SO very true. Science is not a belief system. It’s not something that is infallable, nor is it possible to be completely objective. It can be, and in some cases has been biased, conducted irresponsibly, resulted in regrettable consequences, and paid off. In fact some of my favourite articles and websites of all time are those that critically explain the issues around science, and pushes it to improve! be even more transparent about the issues in scientific research and modern medicine. science that confirms the positive health impacts of nutrition and safe supplementation. Science is a process of understanding the world and ourselves. And guess what? I truly, hand-on-heart believe that it’s the best we have right now! And yes, some of those experiments go wrong. Some of them have been incompetent. Some have never been published. Some of them have been retracted after been found to be fraudulent. But the beauty I see in the scientific process is that it is open for criticism. And the scientific process is improving. I could seriously go on for days, so I’ll end this part here to jump into that #1 credibility booster I promised in the headline. It’s certainly not the only thing necessary, but I personally think it’s the very first step. It’s called “look at the balance of the evidence“. Basically, it means to thoroughly understand an area of expertise. To open-mindedly look at as much of the scientific (peer-reviewed, published) research that you can. Not just the latest study, hottest trend, most popular blogger, or newest documentary or bestseller. PRO TIP: Have you seen my summary of the study showing what makes fake news travel faster, farther, and deeper than the truth? Look at all of the evidence and see what the “balance” is saying. What does the overall foundation of knowledge in this area say? If you’re not familiar with the Cochrane Collaboration, I highly recommend you bookmark their page now. They are independent international researchers who review studies and critically evaluate them, and try to make sense of any conflicting data. Their logo represents a great example of the power of looking at the balance of the evidence. You can read the whole story here, but I’ll give you a summary. Basically there were several placebo-controlled randomized clinical trials that looked at the impact of giving mothers corticosteroids when having premature labour. Some of the studies showed that it helped, others showed that it did not. There were 8 studies in total, and no one had looked at all of them to make a decision and formal recommendation. What the Cochrane group did, was a “systematic review” of the studies to critically evaluate, and figure out once and for all, whether corticosteroids were beneficial or not. They were. They reduced the risk of the babies dying from “complications of immaturity” by 30-50%! But no one saw that because they couldn’t see the forest for the trees. As you can see, by looking at the balance of the evidence, a clear recommendation could be made. And these results became widely known and accepted after the Cochrane review was published and endorsed by the National Institute of Health. This is the crux of looking at the balance of the evidence. All of it. Not just a few studies, but all of them. The best way to do this is to become an expert in your field, and read, understand and evaluate every new study that comes out on a weekly (or monthly?) basis. I’m not kidding – that’s the BEST way to do this. However, I know that because you’re running a wellness practice, you probably don’t have time for this. So you need some credible resources to go to – people who are already doing this. Sorry guys, you didn’t expect me NOT to say this right? Of course you should consider the possibility of them being biased, or taking years to change recommendations, but they actually do a great job at looking at the balance of the evidence and having context. While they may not have jumped on the bandwagon of the most recent study – to me, that makes them all the more credible. Meta analyses and systematic reviews are the strongest type of studies for the exact reason that they are not one study, but a review of several studies (just as the Cochrane Collaboration does). Of course, these are done by researchers themselves, and may not be entirely independent; however, it is much better to consider several studies (as these do), than individual ones. You can find these at PubMed. I’ve attached a link to one of my most favourite infographics in the history of the internet: A Rough Guide to Types of Scientific Evidence. It briefly discusses the strengths of different types of studies. You’ll see that the review studies are definitely the strongest type of study in terms of credibility of results. Of course, when you look at sponsored (non-independent) studies, you need to critically evaluate them (even though they’re peer-reviewed and published). It’s easy to see corporate sponsorship when it’s a declared conflict of interest, but it’s absolutely NOT reason for automatic dismissal of the results when you don’t agree with them. While that certainly has been shown to have an effect on study design, results reporting, publication bias, etc. who paid for a study is just ONE of a bunch of things to consider when evaluating science. Here is a link to my second favourite infographic of all time, also from Compound Chem. This one is spotting bad science. As I said earlier, I give props to those who point out the weak points and push the researchers to do even better. You’ll note in this infographic that conflicts of interest is just one of many, many things to consider. Credibility is something that you build over time. And please, please don’t rely on un-credible sources. 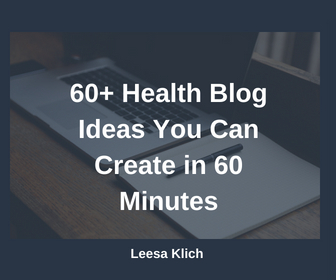 Learn to spot fake health news, and don’t rely on personal experiences, bloggers, documentaries, or bestsellers. Do a bit of research, starting with some of the credible sources in this blog post. Lastly, download my entire list of credible resources so you can refer to the sites on the list in the future. What are your thoughts on credibility and health research? Where do you go for your health information? What do you do when you come across a headline that totally reinforces (or knocks) your professional opinion? If you want my free resource guide to credible websites, as well as tips for using PubMed (including how to filter results for those meta-analyses and systematic reviews), sign up below.